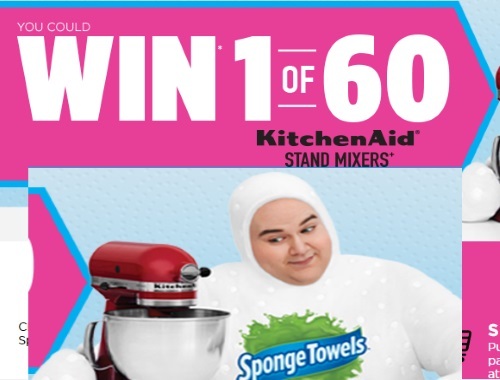 Spongetowels are giving away 60 KitchenAid Stand Mixers! SHOP - Purchase two or more specially marked participating products between September 5, 2017 at 12:00:00pm EST and November 30, 2017 11:59:59am EST at an authorized participating Canadian retailer. Star/check the participating products & the date on your receipt. SNAP - Take a clear photo of your entire receipt with your smartphone. [Max. : 10 MB; .Jpeg; .JPG; .GIF; .BMP]. SEND - Upload your photo to bakeamess.ca. Please allow up to 48 hours for processing. REGISTER - After your photo is submitted, you will need to register your information and await validation.